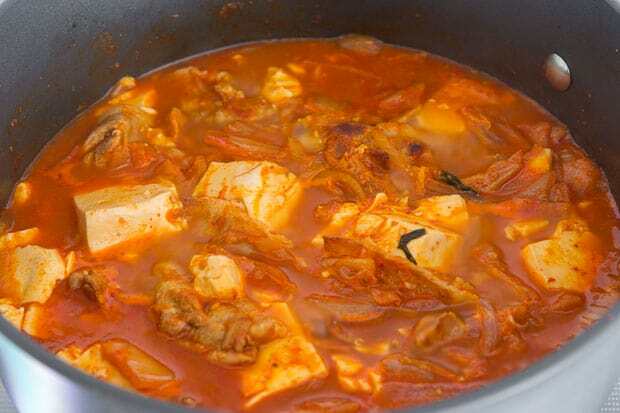 Kimchi Jjigae (김치 찌개) is a spicy Korean stew made with fermented kimchi, pork belly and tofu. 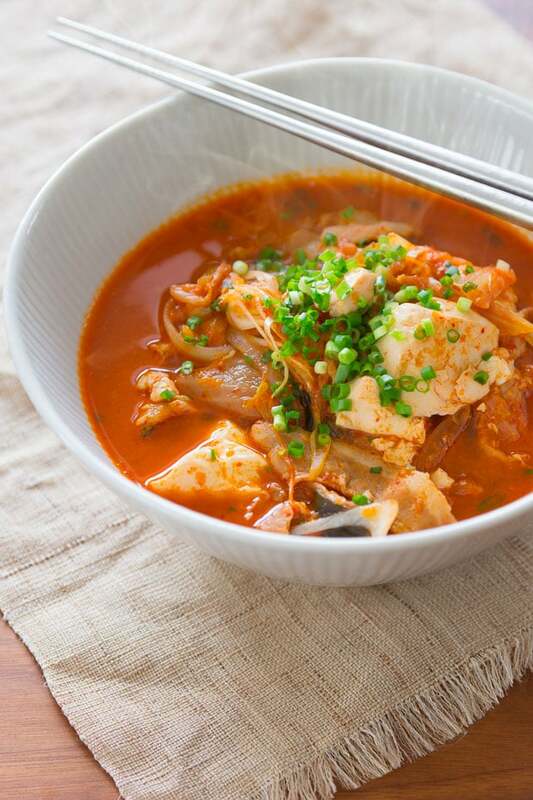 Learn the secrets for the best Kimchi Jjigae with this recipe. It’s been seven years since I started this blog, and nearly five since I posted my Kimchi Jjigae (김치찌개). If I kept track of such things, I’ve probably cooked this dish more times than any other. It’s not just about using leftovers, or having a good taste to effort ratio, this stew delivers the perfect amalgamation of umami, heat and substance which both literally and figuratively warms the soul. Given my recent sojourn in Korea I thought it only appropriate to do a post I’ve been meaning to do for a very long time: Kimchi Jjigae. 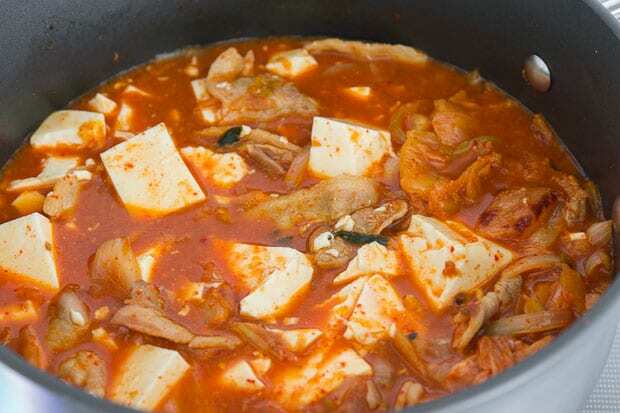 Depending on who you ask, you may see it transliterated as Kimchi Chigae, Kimchi Soup or Kimchi Stew, but it all refers to the same bubbling, red hot cauldron of soul satisfying soup made with kimchi, pork and tofu. 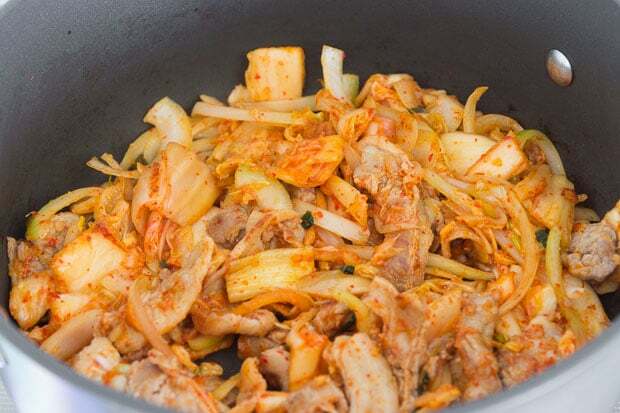 I wasn’t able to find a ton of information on its origins, but it’s not a stretch to imagine this dish was conceived back in humbler times as a way to use old over-fermented kimchi along with a few scarce scraps of meat. When paired with a bowl of hot rice, it will jump start your internal furnace and chase away even the most frigid of winter chills. Like its German cousin sauerkraut, the various strains of Lactobacillus in kimchi convert the sugars in the cabbage into acids over time. At some point, most people find that kimchi gets too tart, making it unpleasant to eat straight out of the jar, but this is the perfect time to turn it into Kimchi Jjigae. The tartness mellows out as it stews with the pork belly and it helps to balance the rich fat from the belly. For those that have never had it before, Kimchi Jjigae may look like it packs a face-melting punch, but it’s not nearly as spicy as it looks. Unlike some Latin American chili peppers, Korean chilies are less potent, contributing sweetness in addition to heat. Of course if you like things scorching hot like me, you can crank the volume by adding more gochugaru. Marinate the meat – It may seem silly to marinate something that’s going to be cooking in a liquid but the marinade caramelizes as you fry the meat, which gives the soup more depth. Use the kimchi juice – This is the red liquid that is released from the cabbage as it’s being pickled. Every package will have some at the bottom and you can squeeze the kimchi with your hands to get more. Add a bit of doengjang – Doengjang is a fermented soybean paste similar to miso that packs a wallop of umami and adds a wonderfully earthy taste to the jjigae. 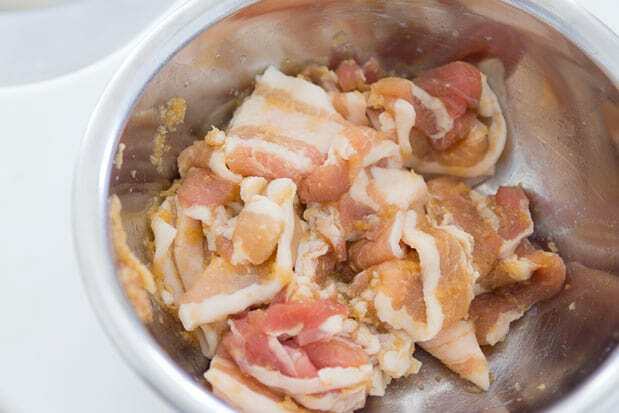 Marinate the pork belly with the garlic, ginger, gukganjang and soju while you prepare the other ingredients. Heat a heavy bottomed pot until hot and then add the pork belly. Allow some of the fat to render out of the pork belly, then add the onions and kimchi. Sauté until the mixture is very fragrant. Add the kimchi juice, water, gochujang, and doengjang, stirring everything together to combine. Bring to a boil and taste for spiciness, adjust with gochugaru to increase the heat to where you want it. Add the tofu, turn down the heat to a simmer and let it cook for 15-20 minutes, or until the pork and kimchi are tender. 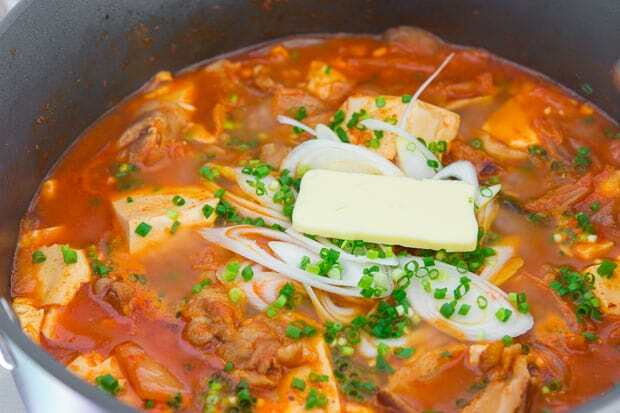 When you're ready to serve the kimchi jjigae, add the green onions and butter and give it a quick stir to incorporate. Put a trivet on the table and serve it straight out of the pot along with a bowl of rice. I love kimchee jigae! Your recipe looks fabulous and I love the photo of the kimchee. Interesting tip about the butter.. will have to try that next time I make this. Oh I have quite the list of things I want to make you have made, but it just so happens that I might make this before all the rest…it is right up my cold hating soup lovin alley! I had to change the shopping list for tomorrow but I can’t pass this up! Looks too good! I HAVE to make this! Marc this looks so good I could eat some right now (6.40am)!! I have a tub of gochujang too 🙂 Just the Kimchi I will need to get. Thanks for sharing – as always your pictures are amazing. The addition of miso and butter is quite interesting. I’ll have to try this version. Thanks for sharing! Love the photos, love the blue pot. I appreciate this post so much, Marc! I’d like to share a tip from my grandma – instead of just water she uses dashi stock made with konbu & anchovies for even more depth, although pork belly alone adds rich flavor. This looks absolutely wonderful Marc…I love spicy dishes! Such a winter warmer. I happen to have some homemade kimchi that is probably getting to the very tart stage, so you’ve just given me an idea as to what to do with it, thanks Marc! It’s just starting to get cold in Tokyo and this looks like the perfect remedy! P.S – This looks amazing!! I involuntary yelped “oh yum” when I saw this. I love kimchee chigae. This looks fantastic. This looks delicious! I would love some right now and I love your tips on the miso and butter. Oh my! This sounds delicious & easy to make. Can’t wait to try it. Thank you! I usually replace 2C of water with 2C of Chamisul Soju. Gives the dish more sweetness and a rather earthy flavor. I’m sure yours is a lot better!! i made this once and mine was a sad excuse of a kimchi jigae. this is hearty! and i’m inspired to make it again so it’ll taste great and look like yours 😉 except, this time i hope not to stink out the whole fridge and fright my housemates into thinking something died in the fridge. I LOVE LOVE LOVE your photographs! !The soup looks delish! Kimchi Jigae always rock mah world! NICE! Made it! Loved it! And I have some left for lunch! The kimchi I used was kinda spicy so I didn’t add any chili paste and that was just perfect. Had to skip the pork belly too as it is pretty hard to find here. The flavor was perfect! This was one of my favorite things to eat when I lived in Korea. So perfect for a cold day! 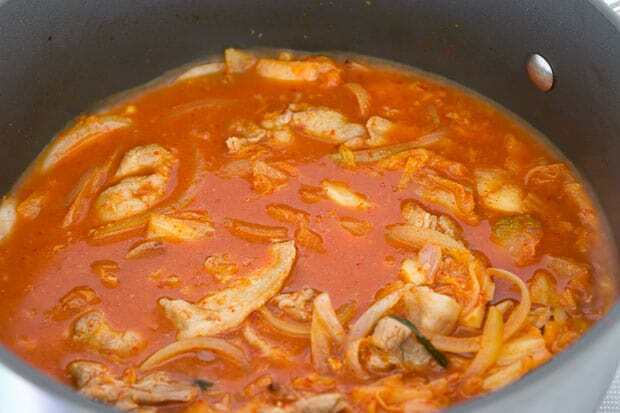 I am totally craving some kimchi jjigae right now! I love how my mom makes it the most – it’s definitely true that the recipes vary depending on household! I’ve been looking for a good recipe for this dish for a while…will definitely try this. Thanks for sharing…it looks gorgeous! oh my. this is one of my favorite things to order when we eat at a korean restaurant. it is unbelievably good and hearty and piping hot. i wait until summer is over to even attempt to eat this. i love that you made this at home – why shouldn’t i try? maybe the next cold night this will be on the menu. it really does look so easy! i can’t contain my excitement. this has me banging down my korean grocers store!holy kimchi! I find what you added about the butter to be particularly compelling. a well position shot of butter leaves everyone in joyous wonder. This is absolutely one of my favorite dishes, but I had never until now considered making it myself! It had always been one of those delightful takeout pleasures but you’ve inspired me to undertake it at home. Kimchi jigae is so good! I have some kimchi fermenting in the fridge right now. That sounds so good, I’ve saved it to my recipe file. Definitely something to do with that aged jar of Kim Chee at the back of my fridge. So glad it doesn’t have to be thrown out anymore. My mom and used to put in dduk and dangmyun (rice cakes and cellophane noodles)…Oooh! And hot dogs instead of pork. Down home and yummy. I wish I had this right now. Kinda done with Thanksgiving foods, this would be the perfect antidote. Yes yes yes!! I love kimchi soup!!! I have been blog surfing while watching football and my bloody menu plans keep changing and you just convinced me that kimchi soup needs to be made this week. You could use denjang or miso but its not original kimchi chigae at all. Cause we have separate “Den jang Chigae ” too..
Where would you recommend buying good kimchee in NYC (or, should I say, where in ktown)?